If you are hankering for some great Christmas hymns and carols then the list below will help you out. 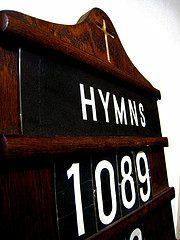 It is 40 of the most popular Christmas hymns/carols, with links to Cyber Hymnal for each hymn. You may also want to visit the Cyber Hymnal website’s Christmas section for an even more comprehensive list. You can hear some mp3s for the songs you can find quite a lot at the Christmas section of Thanks Much. A few of the songs below also have other mp3s highlighted. Free mp3 of Away in a Manger. Download it here. Free mp3 of O Come All Ye Faithful from Songs & Hymns. Download it here. Free mp3 of Silent Night from Rudolf Music. Download it here. You can find more free Christmas stuff including sermons, advent calendars, music, clip art and much more at the Christmas page. You can also find lots of free Christmas songs at the ‘free Christmas songs’ section. image by rache.